Butterfly spreads are one of the most well known and popular option strategies out there today, mainly because they are often referred to in popular option trading books and courses. They work best when a stock is identified as trading within a clearly defined range over a period of time. There are two main schools of thought on identifying range trading stocks. 1. Look for a stock which has been trading in a range over at least 3 months, preferably longer. Such a stock is more likely to stay within that range in the near future. In short, you want to avoid trending stocks. But be careful! There is a difference between range trading stocks and those whose price range is narrowing into a triangle pattern (lower highs and higher lows converging). These patterns often precede a strong breakout and are more suited to straddle trades than butterfly spreads. A sideways channel is better. Once you have identified such a stock, you are almost ready to implement your butterfly spread. First, you then need to locate support and resistance levels at the extremities of the expected trading range, then you should identify option strike prices in relation to those levels. Finally, you would ideally like the stock to be currently trading near the middle of the above support and resistance levels when you place the trade. A butterfly spread is essentially a combination of a vertical debit spread and a credit spread sitting directly on top of one another but with a common middle strike price. So all up, you have 3 strike prices. The two outer levels are known as the 'wings' while the middle strike price is the 'body' of the butterfly. The idea is that you 'buy to open' one option contract of each wing and 'sell to open' two contracts for the body. If you used put options, your sold positions would remain 'at the money' (ATM) but your upper and lower bought positions, as above, would be reversed. Using either call options or put options would achieve the same result, so when assessing which to choose, you would focus on the one that provides the best return on risk. Ideally, you would select option contracts with 1-2 months to expiry. One of the most attractive characteristics about this option strategy is the potential return on investment. If you are able to find a range of option contracts for three strike prices that minimize your initial cost, you can be looking upwards of 300 percent at expiry if the underlying stock closes at the maximum profit level. Your maximum profit at option expiration date will be the difference between the 'wing' strike price and the 'body', minus the cost to enter the setup. So if your 3 strike prices were $5 apart and the whole spread cost you $1 to enter, then your maximum profit would be $5 - $1 = $4 per share per contract, which is 400 percent return on risk. But if your 3 strike prices were $10 apart and the entry cost was $3, then your maximum profit would only be $10 - $3 = $7 which is only 233 percent return on risk. So analysis of the trade's potential before entry is imperative. You want to look for the best potential profit opportunities and this means paying attention to your initial cost. Breakeven points at option expiration are places where, if the stock closes, will make zero profit or loss. These points will be one of the two extremities of the spread, less the initial debit paid. 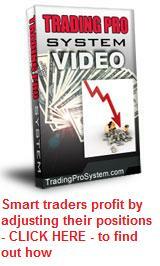 To enter any option trading position you must have sufficient funds in your broker account. You will need enough to pay for the vertical debit spread component of the trade, plus enough to cover the difference between strike prices for the credit spread component. This means less capital will be available for other trading opportunites. Using the case above where strike prices are $5 apart and assuming 100 shares per option contract, you would need $500 + $75 collateral, plus brokerage costs, to do your butterfly spread. Most butterfly spread examples you'll read about will give you potential profit levels at option expiration date. But you don't have to wait till this time to exit the trade. As the expiration date draws near you should assess the probability that you can take profits. As previously mentioned, the maximum profit level is achieved when the stock closes at the middle option strike prices at expiry date. But during the last 3 weeks of the trade, the profit level potential increases exponentially, as your 2 'sold' positions at the 'body' of the butterfly experience the most time decay while your ITM long position still has intrinsic value. As expiry date closes in, you should be aware of where the underlying stock price is in relation to the middle strike price. If it crosses it during that time you may wish to take an early profit. It will not be the maximum profit, but a good one nonetheless - and a smaller profit with certainty is better than waiting another week or two in the hope it will return to this maximum profit level. Let's say you had identified support and resistance levels of a stock's trading range and taken out your butterfly setup using call options. Within a short time, the stock retreats lower to the support level. This will mean that your 2 'sold' ATM positions at the 'body' of the trade are now OTM so you can buy them back for 'peanuts' leaving you with your two long calls - one now 'at the money' and the other way 'out of the money'. If the stock moves back into the trading range again, your long calls will increase in value but now you will have no 'short' calls to offset the gain. If, on the other hand, after your purchase the stock moves up towards the resistance level, you can remember that the top level of your butterfly is actually a credit spread. This gives you the option of 'rolling up' thus extending the 'body' of the butterfly into an Iron Butterfly with greater profit potential. Butterfly spreads are by nature, a more passive option trading strategy than day trading. You don't need to watch them throughout each day, which means you can focus on your career or whatever it is that works for you. You simply monitor them over the life of the options and if you see an opportunity for an acceptable profit, you take it. The main downside is the extra cost of brokerage. Unlike a single long option purchase which would involve two lots of brokerage - to enter and exit, with butterfly option strategies you'll be paying for a total 6 brokerage fees - 3 to enter and the same to exit. So you need to factor this into your decision making process.